It’s hard to know where to begin with Chitoes African Deli. I suppose I was first drawn to the idea of an African deli. What exactly does that mean? Will there be pastrami made from Impala? More realistically, will Chitoes try to offer a survey of major African cuisines or is everything lumped together under the label “African”? I don’t claim to know a lot about African cuisine but I’m sure there are a wide variety of cuisines on the expansive continent. I imagine there’s a more of a difference between Egypt and South Africa than 4,000+ miles. Of course, there was only way one to truly know what Chitoes had to offer and that was to go see for myself. I’ll be frank, if Carpe Jackson hadn’t taken the time to scope out Chitoes first, I would have never known it was there. I don’t often drive on Terry Road and it’s even rarer that I look for lunch there. Of course, Kate is also to thank/blame for me visiting Chitoes for the first time. It was her idea to have lunch and she had a coupon for Chitoes, what other impetus do you need? There really isn’t much to the interior of Chitoes outside of a mural and a tv showing Headline News. In contrast there seems to be a lot to their menu. There was a separate page for each day of the week and a number of dishes that left me puzzled. 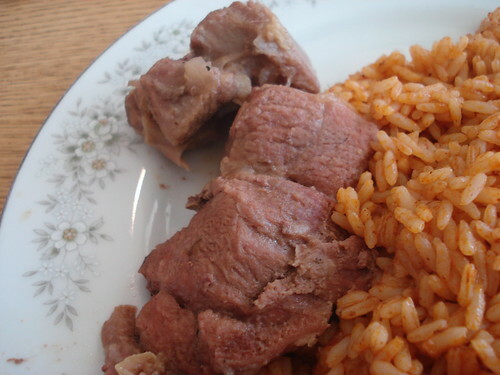 It’s not often that you run across fufu, eguzi, moimoi, jollof rice, or obgnor sopu. With a little guidance from the cashier, Kate and I placed our order, found a table and waited to see what would appear from the kitchen. 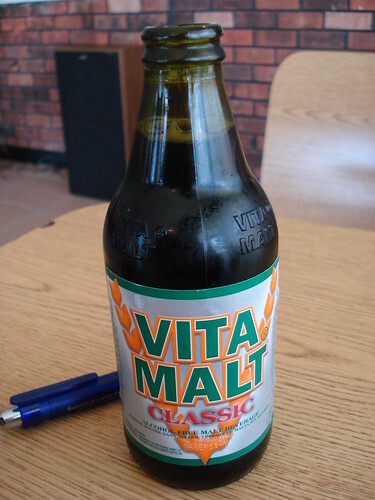 This also gave me a chance to try a bottle of Vita Malt. I think I’ll stick with a Guinness next time. 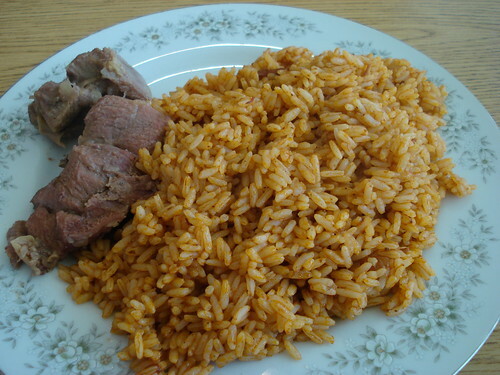 My Jollof Fried Rice with goat meat was the first to emerge from the kitchen. This seemed like a pretty benign introduction to African cuisine. Seemingly non-offensive, this rice had a simple but satisfying flavor. It was a little on the oily side and I kept tasting basil, but I was a fan. As for the accompanying goat, it was a very tender helping of meat. Each piece was savory with the spices highlighting the goat’s flavor rather than masking it. While I was happy with my lunch choice, I have to admit I was a little jealous when they brought out Kate’s lunch. 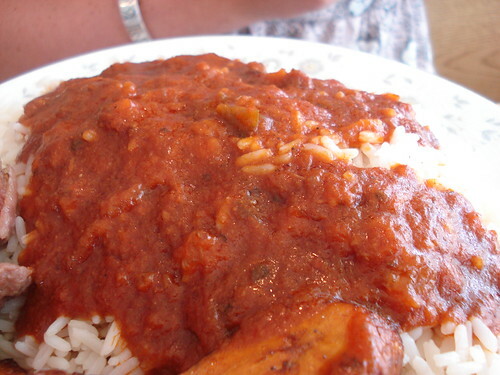 She had gone with an order of African Stew with Rice, and coupled with a side of plantains, it looked delicious. The stew was piping hot and had a very pleasant tomato based flavor. 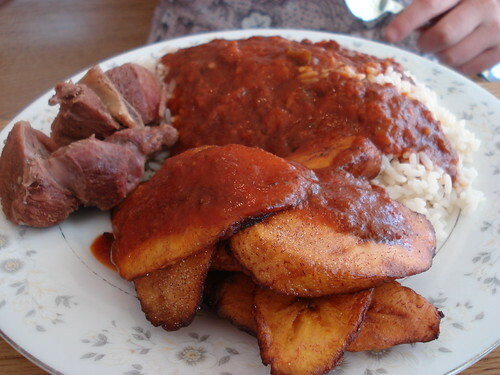 The plantains were equally tasty as they were very well fried and well complimented with the tomato flavor of the stew. As I was paying the bill, Kate struck up a conversation with the cashier and the cook. Apparently the food at Chitoes is based in West African Cuisine. That’s much more specific than the pan-African approach I originally feared that Chitoes had taken. I know I’ve harped on it before but I hate when restaurants try and lump cuisines together. I’m looking at you Pan-Asia. Through no fault of their own, it took my nearly six months to return to Chitoes. I really don’t have a good reason why I was so delinquent. I kept seeing reminders: the folder of pictures from the first visit was still on my main page and every time I reached for my notes, Chitoes was on top. Eventually, I decided to stop waffling and pay Chitoes another visit. Not much has changed since I was last in Chitoes. There still wasn’t much decoration, just a tv and a counter. That’s one way to run a restaurant and it seems to be working for them. With the weather on the chilly side, soup sounded like a great idea. 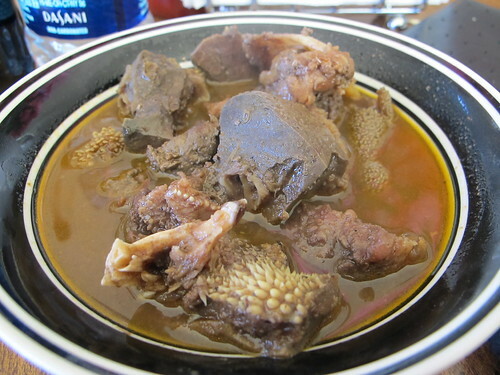 Why not Goat Meat Pepper Soup? That seemed like an excellent idea, it combines all the hearty flavor of goat meat with black pepper, bell peppers, or some chilies, what could possibly go wrong? I certainly wasn’t expecting that. 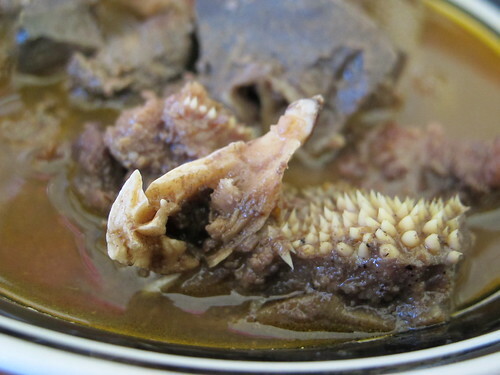 Don’t get me wrong, I love offal, but I prefer to know what I’m ordering, and maybe it’s just me, but Goat Meat Pepper Soup doesn’t scream tripe, bones, and liver. Actually there was a deep flavor to go along with the color of the soup. It was like the essence of goat but with pounds of black pepper thrown in for good measure. One thing you couldn’t escape was that slightly irony taste of tripe and liver. This vaguely reminded me of menudo, mostly because I can’t really enjoy big pieces of tripe. I’ll eat shredded tripe in pho all day long, but give me a big piece of rubbery stomach lining and I’ll unhappily chew for an eternity. 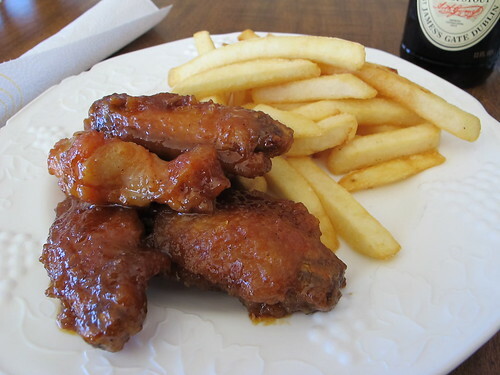 I know it doesn’t seem very exotic, but I also tried an order of the honey wings. Maybe it was because they were written on every page of the menu, but it seemed like a good idea. 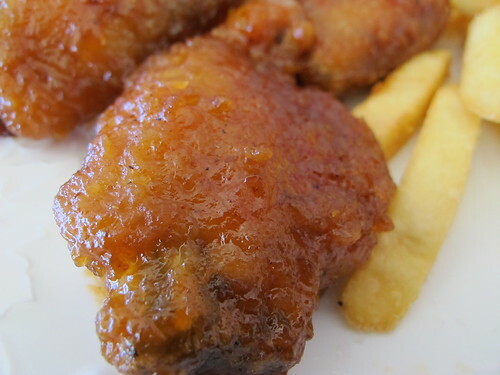 Well, these wings certainly aren’t crispy, instead each wing’s skin was gummy from the thick, sweet sauce. There was more at work here than just honey, but I couldn’t really figure out what. It reminded me a lot of the honey coated spare ribs from Chinese restaurants. 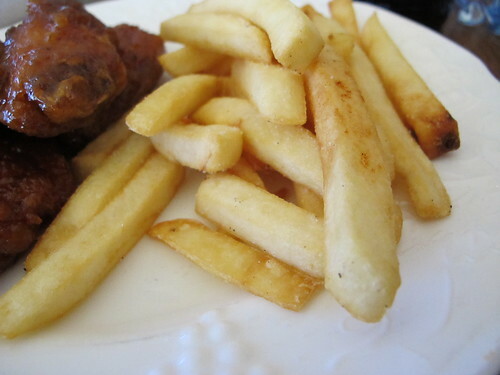 The French fries would have normally been quite decent and nicely salted, but compared to the overpowering flavors of the wings and the soup, they were bland as could be. Looking at Chitoes’ website, the first page offers a few more specifics about their food. Apparently Chitoes strives to serve traditional Nigerian food with some additional American offerings. Based on my extremely limited knowledge of African cuisine, much less Nigerian cuisine, I can’t say much about Chitoes' authenticity. What I can say is that their food is fairly unique for the Jackson area and it is definitely worth a try. Just do a little research beforehand and make sure you ask before you order, sometimes the rather benign descriptions can leave you unprepared for what you’ll receive.